Yes it odd how often it works out like that. I found the same thing with Mago and Kemsa. Possibly some subconscious mechanism at work? Anyway Ahenobarbus and his troop (less the unlucky GERMANICUS) return to Antioch in reasonable spirits. They have lost one of their better fighters, but overall the ludus has done OK. Ahenobarbus has presented good entertainment to the key Romans (and Roman lackeys) in the province, enhancing his prestige and making useful contacts. He has also made some money. GALLUS has picked up the new skill "crowd pleaser" to add to "attack" and "dodge", and he gets half the special prize (the rest gies to Ahenobarbus) taking his credit balance up to 15 aureus. He has now also won three fights (v Umbris, Saburra, and Sejanus, killing the last two. And completed an important dirty tricks mission for Athenodorus. After a fairly ordinary start he seems to be gaining self confidence. It is now 68 AD and news is coming in about world events. 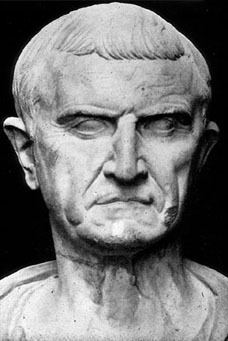 Nero has been overthrown by Galba who has been proclaimed Emperor. Nobody will miss him, although it seems things are not settling down and Galba may have rivals for the throne. But that is all a long way off - news from Italy can take three months to reach Antioch. Nearer home, Vespasian and his elder son Titus have recaptured Jerusalem and seem close to exterminating the revolting Jews. This is generally welcomed, even the Jewish community in Antioch is keeping it's head down. And there is a glut of Jewish slaves on the market including many prisoners of war. Ahenobarbus is able to pick up several likely lads with fighting skills at good prices. Things are also proceeding for the Alexandrian Games, traditionally the first set in each new year and highly prestigious. As City Aedile, Athenodorus can place some of Ahenobarbus's men in key fixtures. 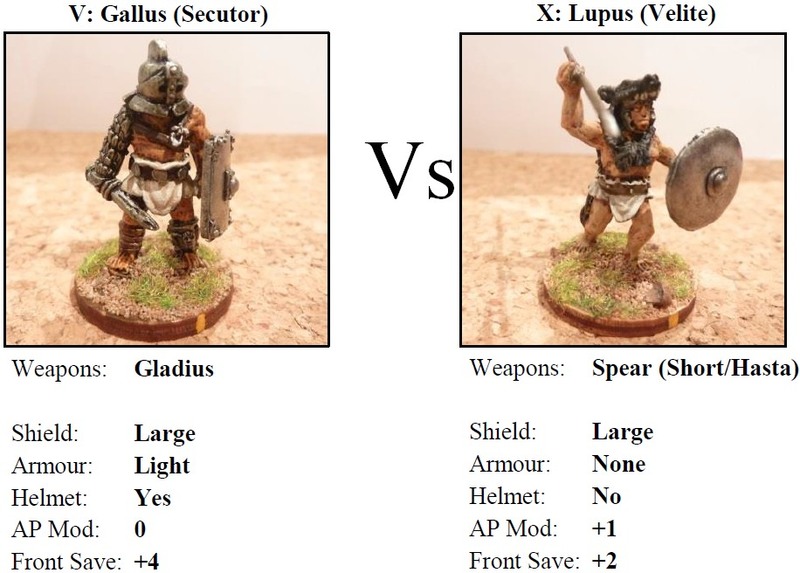 GALLUS is slotted into a prime spot against LUPUS (Velite, skills: Stamina, Reflexes, Dodge). Athenodorus is not being nice to Ahenobarbus purely out of the goodness of his heart, even though open handedness by a patron to a client is a highly regarded social virtue, bringing prestige in itself. Instead, Ahenobarbus (through the intermediary Helios) is becoming Athenodorus's chief enforcer, as he uses his political office to get things done, and enrich himself. He is becoming more Roman than the Romans, whisper his political enemies and enviers. More on thus next time, perhaps. OK, quite an interesting fight. One sided in the end but skills came into full use. 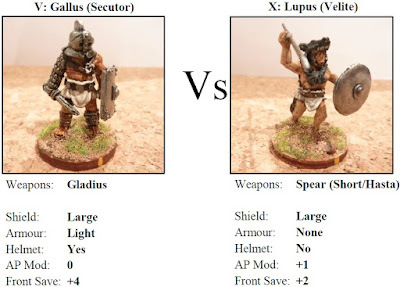 Gallus won with 2 big hits, one doing 6 points of damage, the other 5. Lupus, having stamina, started with 9 strength. Some highlights were Gallus getting crowd favour due to his showmanship that he was working on, which allowed him to do a very rare 7AP move (albeit with a fatigue). Lupus rolled a few 1’s for AP’s but his skill turned them into 5’s & 6’s, so it came to use, but he lost in the end. He rolled 10 for the crowd, so easily survived. Lupus: Lost 10 from 9 strength, 2 fatigue. Lost but survived appeal. The fight was not THAT entertaining, so it is inexplicable why the crowd was suddenly so generous. Maybe they like fighters dressed in wolf skins?